As a guest at a wedding you expect there to be certain rules and codes that you’ll be asked to follow. Some couples ask for no phones or cameras in the hope of an unplugged wedding, others try to enforce a dress code to match their wedding theme. But one bride took things a little bit too far when it came to the wedding dress code for her and fiancé’s upcoming wedding. 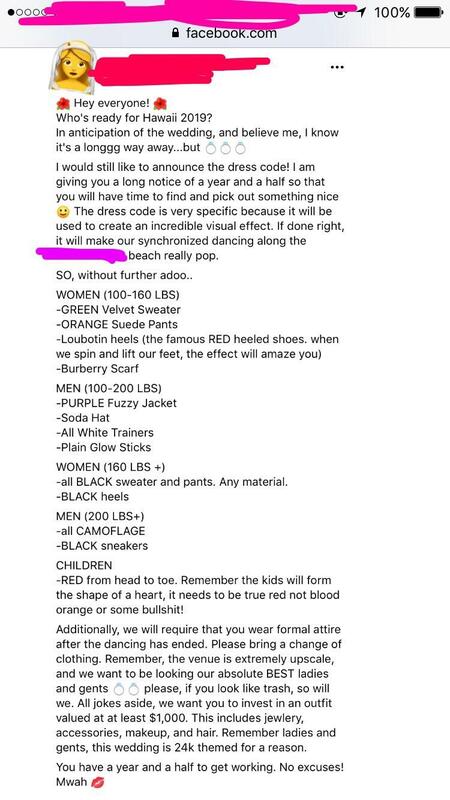 Shared on Facebook and Reddit, the strict list of rules organises guests by WEIGHT for the dress code. Yes, really. ‘Hey everyone’, wrote the bride-to-be. ‘In anticipation of the wedding, and believe me, I know it’s a longgg way away…but I would still like to announce the dress code! Yes. Guests are even being demanded to do a synchronised dance. We’ll give it a miss thanks. She then went to on to explain that any women between 100 and 160lbs should wear a green velvet sweater, orange suede pants, Louboutin heels, ‘the famous RED heels’, she writes, that could cost up £500 and a Burberry scarf, which can cost up to £550. However, any female guests who weighed over 160lbs got off paying the over £1000 outfit bill as the post requires that they wear just an ‘all black sweater and pants. Any material’ and black heels. Male guests were given similar requirements, as they were also divided by weight, however they weren’t lumbered with £1050 designer items. As for any children invited? ‘Red from head to toe’, writes the demanding bride. ‘Remember the kids will form the shape of a heart, it needs to be true red not blood orange’. But that wasn’t all. As well as this outfit, which would cost hundreds of pounds for some women, the bride asked that guests bring along a SECOND outfit as well.